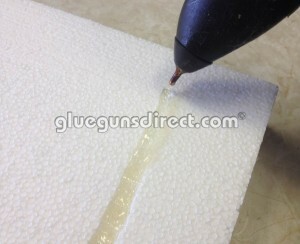 Low melt glue guns & glues are safe & easy to us. They carry a reduced risk of burns due to a lower application temperature and are commonly used for bonding heat sensitive materials e.g. polystyrene, and are used extensively for arts and crafts. With the reduce risk of burns these tools are used in schools, colleges, universities and education academies and organisations. Hot melt adhesives will damage materials such as polystyrene! Low Melt Adhesives are suitable for use on temperature (heat) sensitive materials that would be damaged by normal hot melt adhesives. A bead of hot melt will melt into polystyrene! Low Melt adhesives are fast setting adhesive can also be used for carton closing and other applications involving paper, board, wood, GRP, aluminium and some plastics. It is also useful for expanded polystyrene and polyethylene foam assembly, as the low application temperature prevents thermal damage distortion. Prices are plus vat and maybe subject to carriage charge. 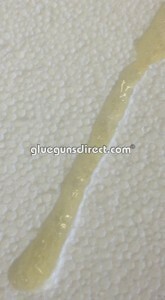 Tec glue gun 12 month warranty maybe null and void if a non-Tecbond glue stick has been used within the tool. Please call 0161 627 1001 for further details. Promotions are website only offers. Nothing within these promotions affects your statutory rights.